Over the past few weeks Mommy and I have been following the adventures of the beautiful foster family being cared for over at the Three Tiny Tabbies blog. 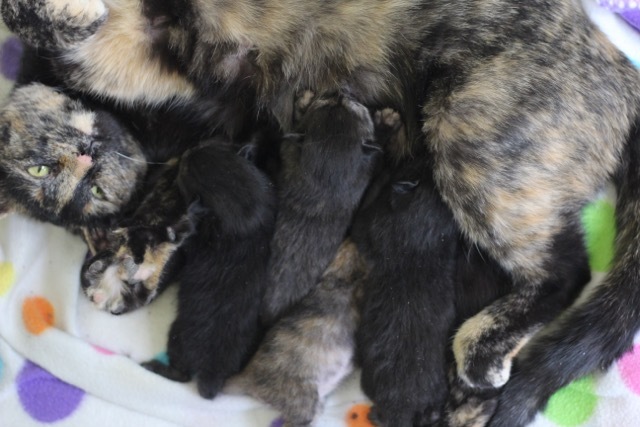 Mama Mimosa and her five little nuggets Fizz, Sparkle, Spritz, Bubbles and Pepsi, otherwise known as "the Effervescats" are so ridiculously adorable they're seriously in danger of breaking the internet. I reached out to Mimosa to see if she might have a few moments of free time from her new mom duties for a little "tortie to tortie" chat. Welcome, Mimosa! Thank you so much for chatting with me today. 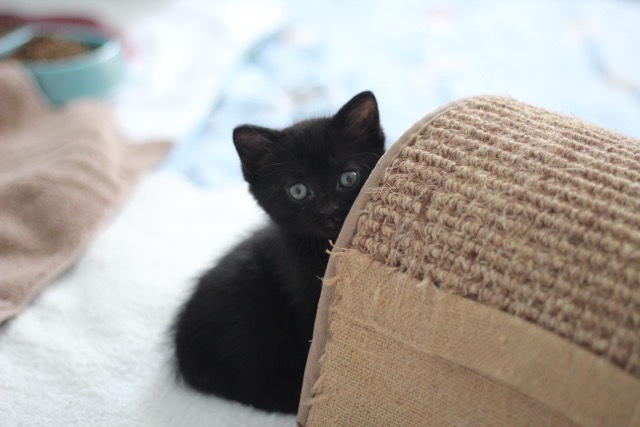 Could you tell us a little about yourself and how you came to arrive at your foster home? 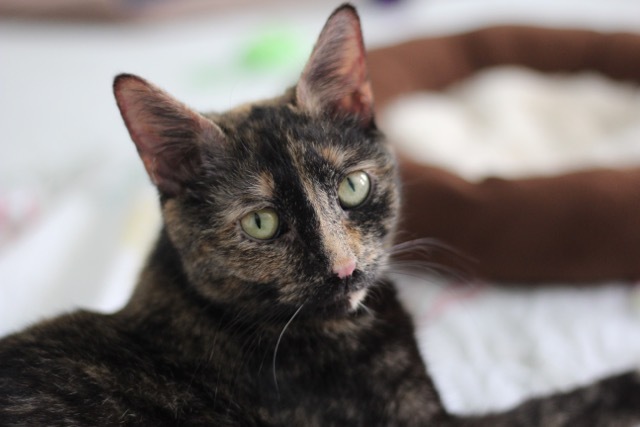 I’m a gorgeous tortie girl with an ample amount of tortitude. :D I’m very protective of my babies and I hiss whenever my foster mom opens the door, just in case there might be somebody out there. When I’m not protecting my kittens, my foster mom says I’m really sweet and like to come up next to her for some attention. Where I came from… I showed up as a stray kitty outside someone’s house. The lady that lived there gave me some food, so I stuck around for a while. About two months later, she realized I was pregnant and called Animal Control to come and take me to the pound. At first, I was scared and didn’t know what to do other than huddle in the back of the cage. Luckily, I didn’t have to be there for long. The animal control officers called my foster mom and asked if she could come get me, which she did! It must have been a terrifying time for you not knowing if you were going to have a safe place to give birth. What do you remember about that time? I remember being frightened because I wasn’t sure where I was and if I would have a safe place to raise my babies. I remember the lady gently urging me to go into the carrier, but I didn’t know where I’d be going, so I just stayed where I was. I didn’t object, though, when she picked me up and put me in the carrier. She took me to a quiet place with soft blankets and yummy food. The vet said I wasn’t due for another week, but once I realized that we were safe, I decided I didn’t need to wait any longer to have my kittens - and they were born the next day! So your precious packages arrived just a day after your foster mom brought you home. Tell us about them. My kittens are now almost seven weeks old and they are CRAZY! They get bigger and more active every day. They love sitting on the humans' laps and they’re learning to climb everything in sight. These days, I mostly like to sit on the countertop and watch them - though I do sometimes let them play with my tail. What inspired your adorable names? Kittens are always SO playful and full of life and zest and energy, so my foster mom thought it’d be cute to give us all names that related to effervescence and fizzy drinks - hence, the “Effervescats”. 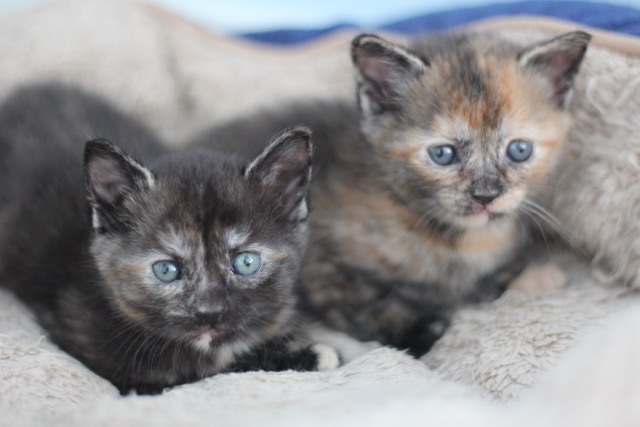 Are you teaching the "two tiny torties" how to rock the tortitude? Oh, yes, absolutely! I’m teaching them to be strong-minded and sassy. My foster mom says we (torties) dance to our own tune. What's next for your little family? We’ll spend a few more weeks in foster care ’til the kittens are old enough go to the vet to be tested for FIV/FeLV and given their first shots. I’ll be spayed and get my shots, too, and we’ll all go up for adoption. The kittens will all be adopted in pairs or with another kitty in the home - it’s important for them to be socialized with other cats while they’re still young. They will also go home with a spay/neuter voucher and will be fixed by the time they’re four months old. Then all we have to do is enjoy life and keep our families entertained! Lastly, do the babies have anything they'd like to chime in? 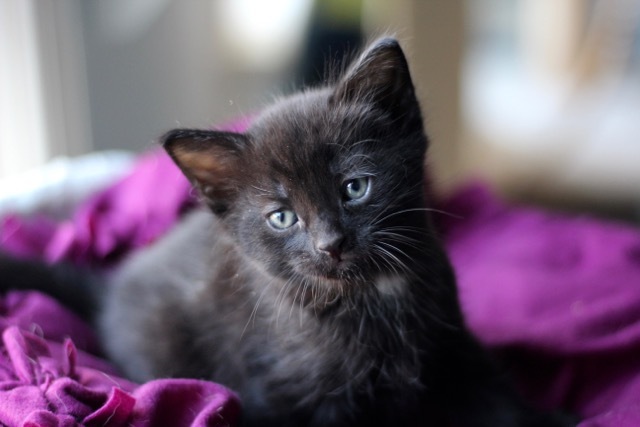 As kitten season approaches, the Effervescats would like to encourage everyone to help in any you can - whether that be through spaying/neutering your own pets, volunteering, donating, adopting, participating in TNR projects, or especially fostering! 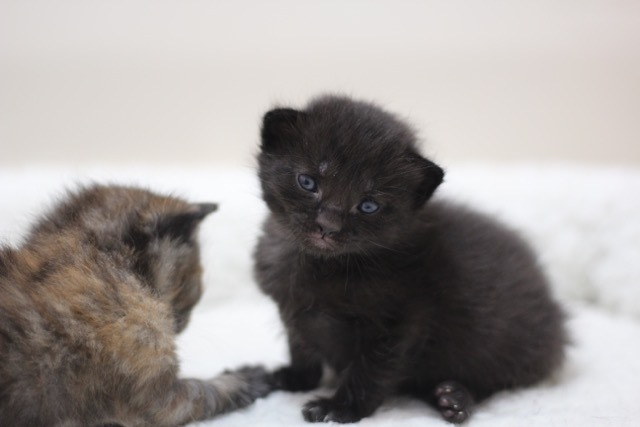 There are many other pregnant kitties and nursing moms that need care and us kittens are SO much healthier when we’re raised in a foster home with someone to look out for us. Follow the ongoing adventures of Mimosa and the Effervescats at the Three Tiny Tabbies blog, as well as on Facebook and Instagram! Oh my goodness, this is more cuteness than I can handle. Mimosa and her kittens are just so adorable. 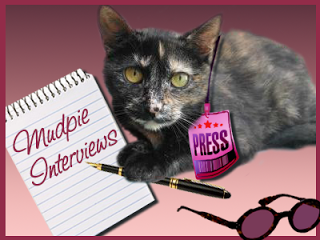 And what a fantastic interview you did here, Mudpie, as always! OMC, this family is adorable!! We are glad you are safe now. Absolutely precious! I hope they all find loving, forever homes. Great interview, such a beautiful little family. It would be nice if they got adopted in pairs and one kitten got to be adopted with the Mom. Tiny torties and housepanthers. I am done. Their beautiful mom raised them right! mudpie....what a sooooper grate interveew two day ~~~~ !!! OMC! Mama Mimosa is a beauty! I can definitely see how this little family might just break the internet. Great photos, and a terrific interview!